Geneen's free calls are open to everyone, and are a chance to explore her core teachings. 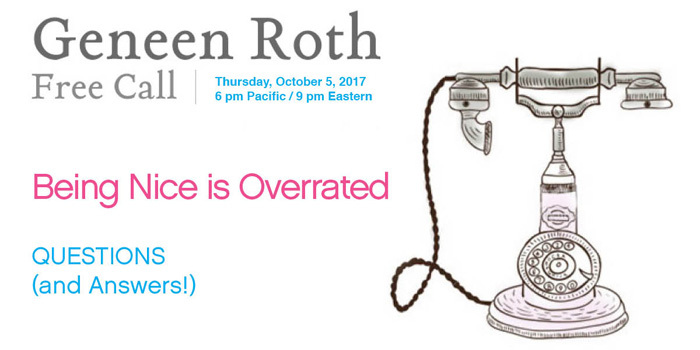 In our upcoming free call -- Thursday, October 5th -- Geneen will discuss the essentials of how to be at peace in our bodies, with the food we choose, with our decisions, and in our interactions. We'll discover how to ask ourselves what is driving us. Or why, at the end of the day, we end up discontent and making ourselves wrong in some way. Register below to join Geneen's free calls and receive automatic notification with all the information to connect this Thursday, Oct 5th, live by phone or streaming online from our website.